The IUF reported in September 2017 on the New Zealand Supreme Court ruling that NZ Meat Workers Union members at the Talleys/AFFCO meat processing plant in Wairoa, New Zealand had been unlawfully locked out of their employment during 2015. Union members had been without pay for 5 months. In Marshalltown Iowa, workers in the meatpacking sector from Central America, Asia, and Africa have gained citizenship with the financial and practical assistance from their union, UFCW Local 1149. Several hundred members of CC.OO and UGT assembled outside a meat sector trade fair in Madrid on September 19 to call for living wages and secure, regular employment in the Spanish meat sector. In recent years employers have taken their demand for employment flexibility to the extreme through the establishment of fake worker cooperatives and the contracting of vulnerable workers in bogus self-employment arrangements. 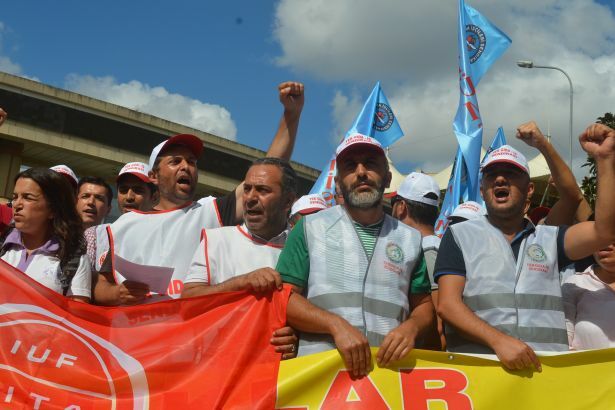 A large rally on September 18 in front of Cargill's Istanbul head office, with participants from 22 trade union, civil and political organizations, showed the wide support for the fourteen workers and members of IUF affiliate Tekgida-Is who have been continuously protesting since they were dismissed over 150 days ago while organizing a union at Cargill in Bursa-Orhangazi, Turkey. The IUF Meat Division resolved at a planning meeting in San Francisco on March 14 & 15 that affiliates must be at the negotiating table in discussions over environmental policy and changing jobs and is planning to increase its knowledge and resources to equip affiliates to defend the rights and interests of their members. 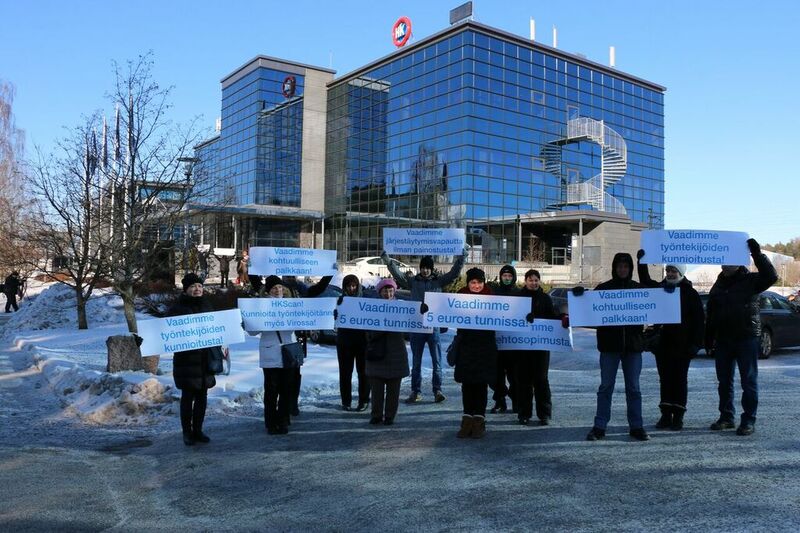 Workers on the slaughter line at the HKScan meat factory in Rakvere, Estonia have been on strike since February 6 for their right to union recognition and a wage increase through collective bargaining. Slaughterhouse workers at Rakvere, Estonia struck spontaneously in October 2017 at the repeated refusal by their employer, the Finnish transnational HK Scan, to offer a pay rise. Following the strike the workers were organized by local union IMTAL which is affiliated to the Estonian Trade Union confederation (EAKL). The union entered into formal negotiations with HK Scan but the company obstinately refused any pay increase. A final attempt to negotiate a settlement on February 1 failed and the workers began a new strike on February 6. IUF affiliate the NGG has concluded difficult and lengthy negotiations on an industry wide collective bargaining agreement (CBA) which sets minimum working conditions in the meat sector. The CBA must now be approved by the Bundestag, as the agreement is part of changes to the Posting of Workers Act which sets the rules on migrant labour 'posted' in Germany from other countries within the EU. Poultry workers in the United States have won an important victory after campaigning against a petition by the National Chicken Council to the Food Safety and Inspection service (FSIS) to remove the maximum line speed. They defeated a proposal that would have put workers at greater risk of injury and consumers at greater risk of illness. U.S chicken companies are once again seeking US Department of Agriculture (USDA) approval to increase line speeds from 140 to 170 birds per minute. The move is strongly opposed by unions, academics and meat inspectors citing worker safety and food safety concerns. 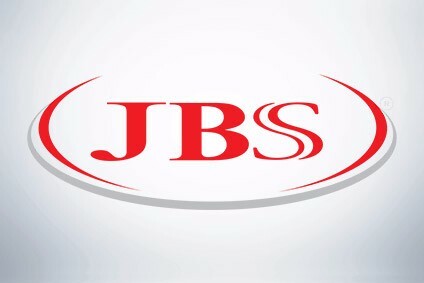 Brazilian meatpacker JBS, on an asset selling spree to pay fines after executives admitted bribing politicians in Brazil, has announced it is selling Northern Ireland based Moy Park to Pilgrims Pride, a company in which JBS has a 78% shareholding. Poultry processor Moy Park has 13 plants in the UK, Ireland, France and the Netherlands and processes 5.7 million birds per week. U.S. based Pilgrims Pride will use Moy Park as a platform to expand its operations in Europe. The New Zealand Supreme Court has dismissed Talley/Affco's challenge to the Court of Appeal ruling that the company unlawfully locked out workers at the beginning of the 2015-16 meat processing season. Talleys/Affco argued that the workers were not employees at the time they were locked out due to the seasonal nature of employment. However the Supreme Court ruled that the company had obligations to re-hire workers in line with the existing union contract. The U.S poultry giant will invest $320 million in a new complex at Tonganoxie, Kansas to produce for its new No Antibiotics Ever (NAE) brand. The facility will process 1.25 million chickens a week and employ up to 1600 workers. As a result of campaigning by the IUF affiliate NGG, meat-processing employers must now assume liability for the actions of their subcontractors and for the payment of social security contributions. The United Food and Commercial Workers International Union (UFCW), the primary union for 70,000 poultry workers in the United States, has congratulated Tyson Foods for pledging to create a better workplace at its production facilities with new and expanded initiatives on safety, transparency, and compensation. National strike action on April 11-12 by poultry and rabbit slaughtering and process workers in Spain has brought the employers back to the bargaining table. The news that the UK food company, 2 Sisters, is to close its Smethwick poultry plant in the West Midlands has been devastating for the 630 workers and their families. 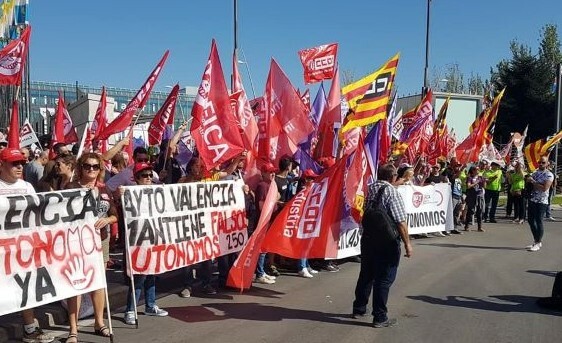 Spanish poultry and rabbit slaughtering and process workers have responded to an employer attack on their employment security with a two day national strike on April 11 and 12. Striking workers are demanding that employers return to the negotiating table to strengthen stable employment, end subcontracting and improve wages. The IUF affiliated Brazilian National Food Industry Workers Confederation-CNTA(Confederação Nacional dos Trabalhadores nas Indústrias de Alimentação e Afins) has expressed outrage at the widespread corruption between the executives of major meat companies and the Ministry of Fishing and Agriculture, uncovered by federal police in an operation dubbed 'Weak Flesh' and which may have led to the export and domestic sales of rotten meat. Members of the New Zealand Meat Workers Union (NZMWU) have voted overwhelmingly in favour of a new collective bargaining agreement with Talleys/AFFCO. 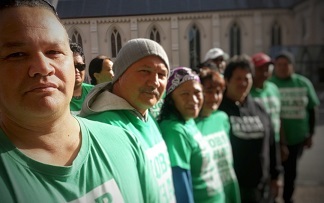 The Agreement follows a two year fight with their employer which included a 5 month lockout at the processing plant in the town of Wairoa, the dismissal and reinstatement of union leaders, various court proceedings and a refusal by the company to recognize the union for the purposes of collective bargaining. The Spanish Parliament has approved a legal change that will prevent companies from outsourcing the most important parts of production to false cooperatives and employment agencies. The change will make working hours, salaries and social security at least the equivalent of those prescribed in collective bargaining agreements that apply to employees. The U.S. meat giant Tyson has acknowledged that the Securities and Exchange Commission (SEC) is investigating its chicken pricing practices following allegations that the company conspired for years with its competitors, including Pilgrim's Pride(JBS) and Sanderson Farms, to keep prices artificially high through buying each other's products and shipping excess breeding stock to Mexico. In the second half of 2016, U.S. affiliate the UFCW settled a number of local collective bargaining agreements with JBS, Tyson, Smithfield and Cargill. In a tough bargaining environment the union was able to protect pension and health insurance plans for its members and negotiate regular wage increases throughout the 5 year term of the agreements. The meat packing industry in the United States will be seriously impacted by President Trump's four month freeze on the nation's refugee programme and the 90 day ban on entry from seven predominantly Muslim states in the Middle East. On October 19, the German Food Workers Union NGG organized a conference for IUF European meat affiliates at Rheda-Wiedenbrück, where Tönnies, Germany's largest meat processor is based. According to the NGG, 3500 of the 4000 employees in the production line at the local factory are employed under temporary work contracts. After the New Zealand Employment Court ruled last February that the Talleys/AFFCO brutal 5 month lockout of union members was illegal, the company appealed the decision to the Court of Appeal- and lost again. Meanwhile in a separate case another Talleys owned meat company (Land Meat NZ) has been fined NZ$15,000 and ordered to enter into an arrangement to enter collective bargaining with the union within 6 weeks. The Meat Division seeks cooperation between affiliates in reversing the trend towards outsourcing and the use of employment agencies to supply labour, and in investigating and publicizing any links between worker health and safety and food safety. The company forced workers to pay them prohibited fees, unlawfully withheld wages, calculated payment on the number of chickens caught rather than on time worked and traveling time, and failed to ensure adequate facilities for workers to wash, rest, eat and drink. Two recent reports have again highlighted the dangerous and undignified working conditions in many poultry processing plants in the United States. The healthy and safe exceptions are primarily in plants that have unions, which offer important protections, inform workers of their rights, and ensure they have a voice on the job. The New Zealand meat company Talleys/Affco has intensified attempts to eliminate the New Zealand Meat Workers Union as it continues to injure record numbers of workers. IUF affiliates in Asia/Pacific have been holding rolling actions to show solidarity and support for the New Zealand Meatworkers' Union fighting for union rights and safe working conditions at Talleys/AFFCO. Through the IUF, unions in Bangladesh, Hong Kong, India, Indonesia, Pakistan, the Philippines and Thailand have been demonstrating their support. The dozens of actions involve workers in dairy, fast food, fishing, sugar, food processing and agriculture and unions in transnational companies including Coca-Cola, Danone, Nestlé and Unilever. The District Court in New Zealand has ruled that serial rights abuser Talleys/AFFCO failed to meet its statutory obligations to provide a safe workplace after an experienced worker was impaled by a meat hook and dragged along the line at the company's Rangiuru plant. 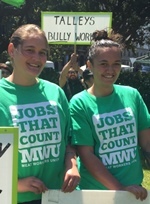 Members of the New Zealand Meat Workers Union began returning to work at the Talleys/AFFCO Wairoa plant on February 22 following a court decision ordering the company to end the brutal 5-month lockout of union workers. Northwest Arkansas Workers' Justice Center (NWAWJC) released a report describing the appalling conditions and everyday struggles that face poultry workers. To bring about lasting change in the poultry sector, workers must organize. Despite a denial from the company that Chairman Joesley Batista or any other executives of the world's largest meat processor were involved in the transaction, the news sparked a sell off in shares. According to the New Zealand government's Accident Compensation Corporation, nearly 5,000 Talley's workers have been awarded over USD 4.7 million in compensation for workplace accidents over the last three years; 1,286 Talley's workers were injured on the job in 2014 alone. Two hundred workers at AFFCO, the New Zealand meat company owned by the anti-union Talley family, have been locked out since June last year for resisting the company's brutal push to replace negotiated collective agreements with individual contracts. Talleys/AFFCO is also punishing union members and workplace representatives with suspensions and dismissals. CLICK HERE TO SEND A MESSAGE TO TALLEYS/AFFCO! IUF affiliates from the Americas, Europe, Asia and the Pacific gathered in Chicago on October 13-14 for the 3rd IUF global meat conference. Participants endorsed a proposal for the establishment of an IUF meat division within the structures of the IUF to assist increasing union membership and strength and building effective union coordination on organizing and bargaining at all levels. What do you do when your sales revenue exceeds USD 50billion a year? You go shopping! Three major acquisitions were made by JBS within a year. 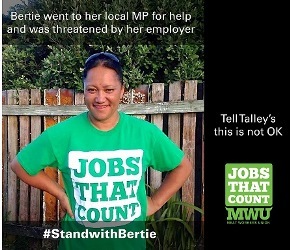 AFFCO Talleys which locked out its workforce for several months in 2012, has threatened a butcher who has 15 years service with the company that she may not be re-hired after she approached her MP for support. Meat companies are increasingly employing migrant workers on temporary work visas to fill job vacancies in the seasonal Australian lamb processing sector. When lines and plants close due to supply and demand factors migrant workers are particularly hard hit. Following six months of negotiations and campaigning, the workers union of the meat industry Criciuma region (SINTIACR), part of the IUF Brazilian affiliate CONTAC, has achieved a good outcome in their collective bargaining with JBS. Go here to sign the union petition to demand payment to dozens of backpackers who are owed tens of thousands in backpay! B&E poultry should abide by Australian workplace law and stop exploiting workers on holiday in Australia that have language barriers or a lack of Australian workplace knowledge.